After a full day of fun plus swimming in the pool with the waterslide, we headed into Glen Arbor for dinner. It was getting a little chilly so we didn’t eat on the dock, but we still love the food at Boone Dock’s. My daughter had a little too much fun and immediately fell asleep on my lap in the booth, so we got her dinner to go. We then had to hit my required destination Cherry Republic. I always have to stock up on wine, and the kids love the free samples of food and treats. We ended up with wine of course, chocolate covered cherries and sour cherry gummies. Now that my daughter had a nap and snacked on her dinner, we hit the tennis courts and the playground next to it. 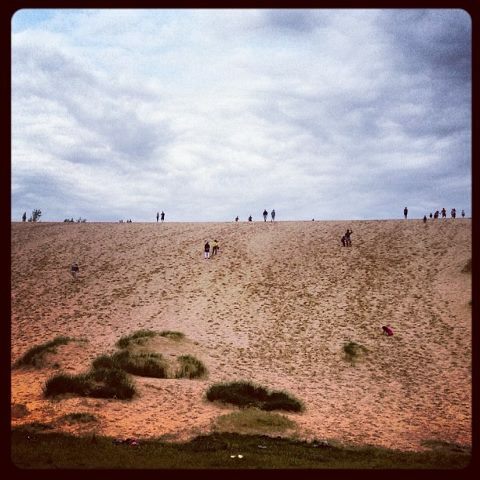 We asked the kids what they wanted to do on Sunday and the votes were unanimous for the dune climb. We had to wait out some pretty heavy thunderstorms in the morning, but as soon as it was clear, we headed to Sleeping Bear Sand Dunes. A year and a half ago, we only made it past the initi al climb and one more small hill. 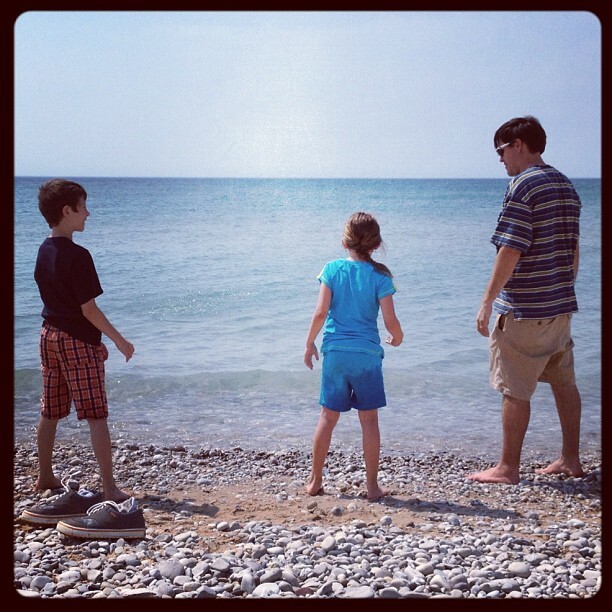 This year, the kids were much bigger, mom and dad were in better shape so we made it all the way to Lake Michigan! It was quite a hike up and down sandy dunes but the kids (and mom) were troopers. Afterwards, we stopped for a well-deserved ice cream in Glen Arbor. The boys decided they weren’t quite done so they dropped us off and went golfing at Manitou Passage. My daughter and I decided to cool off at the pool, but it was a little too cool for me after the earlier rain, so I stuck to the hottub. We had a late dinner in the hotel when the boys got back and that was the end of our adventure. If we had more time, we would’ve added canoeing, putt-putt and bike riding to the mix. Even so, everyone agreed that it was a Pure Michigan adventure. We can’t wait to do it again! I’ve been studying our summer calendar so much that I’ve actually printed out June, July and August and have penciled in various scenarios. I recently started a new job and have some days off, and this will be the first summer that my husband is full time in his new job. Although he works from home, he travels quite a bit. So when he’s gone, I need to find camps, grandmas or other resources for the kids. 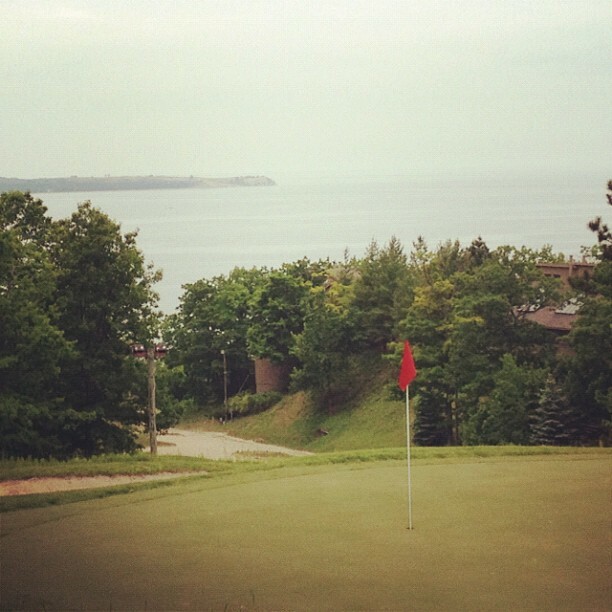 The Homestead Resort in Glen Arbor: This is one of our favorite places. 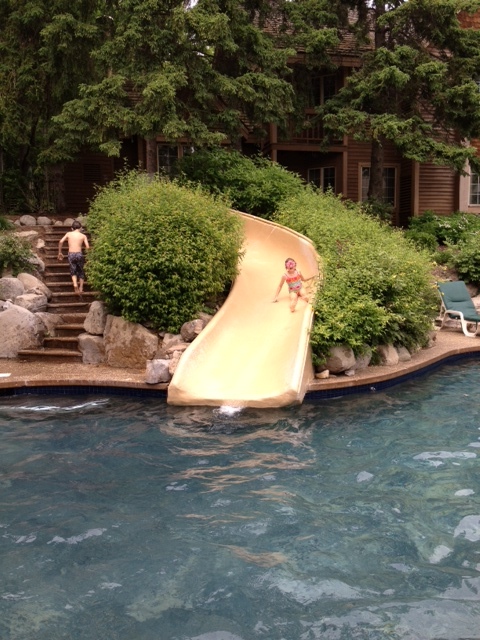 The resort has so many things – a pool with a slide, a pool with a waterfall on Lake Michigan, golf and a gorgeous spa. The kids love to wander around by the fiddling frog and explore the resort. Also, Glen Arbor is a great summer town. I always stock up on my cherry wine from the Cherry Republic while I’m there (there’s a store in Ann Arbor but no liquor license – boo!). They have public tennis courts, a great canoe rental place and a fun putt-putt golf that also has a giant chess etc. Cabo San Lucas: I’m lucky enough to tag along on a work trip with my husband and will have many tales and adventures to tell! Charlotte, NC: Type A Parent Conference: This will be my third year at the conference and second as a speaker. But, it will be my first time as “just” a blogger. Although I have a new job, it has nothing to do with female bloggers, unless they happen to be University of Michigan alumni. I’m excited to see a new city (Charlotte) as well as see so many familiar and friendly faces a this conference. Now that I’m really making a go of my site, I’m also looking to pick up tips. Ontario, Canada: We’re starting to loosely form a trip to Canada, specifically the area north of Toronto near Blue Mountain. There are some resorts there that my husband may review, and we’ll tag along as a family. While we’re there, we may plan a trip to Niagara Falls on the way back. We’ve been there as a couple but really want to take the kids. The main strip there is like Las Vegas for families – dinosaur putt-putt, Ripleys, waterparks and you name it. On my wish list, which I think will be future summers, are visits to the Grand Canyon, Colonial Williamsburg and Washington D.C.
Our first stop on the Carnival Conquest cruise was Montego Bay, Jamaica. Before the cruise, I did not find any excursions that we wanted to try. I would have loved to see the falls but that would mean 1 ½ hours on a bus each way – not how I want to spend a vacation. We took a cab, more like a bus, to Doctor’s Cave Beach. On the way, they tried to sell us into an island tour but in the end most of the people just wanted a ride to the beach. It was $6 per person and $3 per child to enter the beach, plus fees for an umbrella and chairs. It was well worth it. The beach was clean, beautiful and had two water trampolines that kept my kids entertained all day. There were a few vendors there but mostly under control. What surprised me the most was that they were wading in shallow water, so when you went out, they stopped to ask if you wanted your hair braided or a conch shell to buy. Overall, it was a perfect lazy day at a sunny beach, even if I did end up with too much sun. This was the stop we loved the most. The day was hot without a cloud in the sky. We got off the boat and met our tour guide (we had booked the cruise through Travelocity and had a discount voucher for this tour). We were taken by bus to the other side of the island (a short drive) to a boat where we were off on our stingray and snorkeling adventure. The first time the kids felt the stingray glide across their legs, they were both back up on the boat pretty quick. Although that’s what I wanted to do, too, I stuck it out and am so glad I did. The stingrays just swam around and we held on to pieces of squid that they sucked out of our hands like a vacuum cleaner. We saw some other fish swimming nearby, too. Our guide also pointed out the point where the water changed, which is where the Cayman Ridge is. After the stingrays, the boat took us to another location to snorkel. My son jumped in and got some water in his snorkel tube and started to sputter. He got back on the boat, adjusted it and came back in and took off exploring. I was so proud of him! He gave it another try and realized that he loved it! Now I know that there are groups who are against any interaction with dolphins but I did do some research on this company and felt that they had the best combination of dolphin care and provided an educational experience. We went to Chankanaab Park for our Cozumel excursion and swam with the dolphins. If you’re not on an excursion, I still recommend this park. Although there’s an entrance fee, the beach is clean, there are restaurants and food service to your beach chair, and it has everything to keep everyone happy. You can even walk around a shaded path to see some stone monuments. We decided to snorkel here, and I stayed with our gear on the beach. My husband said he pointed out a small octopus to my daughter, who then proceeded to climb up on his back, get out of the water and never went back in! And I thought she was the brave one. My husband and son ended up swimming and snorkeling while my daughter played in the sand and I read a book. Finally, it was our turn to swim with the dolphins. We were with one other family, who was from Canada. The mother did not know how to swim and even she was able to do everything we did. The kids love kissing and talking to the dolphins, and we learned a lot about their habitats and how they rehabilitate them at the park. The ports of call were all great experiences on this trip and our family learned a lot about different cultures and climates. We’d definitely go on a cruise again! If you’re looking for recommendations on ports, cruises and excursions, I found the Cruise Critic forums to be extremely helpful. Baseball season started last weekend. My son played 2nd base, catcher and was the closer (closing pitcher) for the game. Allow me to brag for a moment because the coach gave him the game ball. Not every game he has ends this way, sometimes there are tears, so the need to cherish the accomplishments is a goal.